For Trial Attorneys: Effective, research-based, specific recommendations for persuading the jury. I could stop writing this review with the above title. But if you are a trial attorney a longer summary would include: This is a large book, and it is packed with the themes, analogies, and arguments that juries find persuasive, presented so that you can use them to convince juries in all your civil cases. 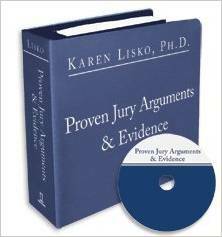 Karen Lisko, PhD, a psychologist and noted trial consultant (you can’t afford her in the average case) has observed hundreds of mock juries and conducted scores of post trial interviews of jurors. She has used the research to devise jury arguments (opening and closing) and recommend the types of supporting evidence that have been proven in actual trials to work. Best ways to argue damages. At the Amazon site page for this book, down near the bottom, there is a review of Lisko’s book by Jeffrey Frederick. You may recognize him as the director of jury research services for the National Legal Research Group in Charlottesville, Va. The National Legal Research Group has been in business successfully for scores of years, and Frederick is a psychologist with his own book on the subject of what juries are likely to do (by a different publisher): so it is high praise when he says in his review that this is a “must have” book for trial attorneys.